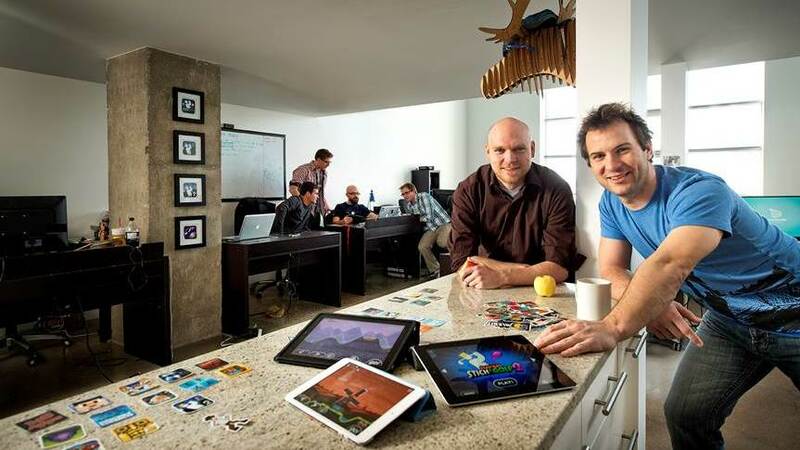 Saskatoon may not be commonly associated with Silicon Valley, but that hasn't stopped local technology companies like Noodlecake Studios from making a global impact. Co-founded by entrepreneurs Jordan Schidlowsky and Ty Haugen in 2011, Noodlecake – an online game developer and distributor – has seen a couple of its innovative multiplayer titles, Super Stickman Golf and Flappy Golf, enhance its world reputation to the point where developers are seeking it out to release and market its games. The studio, which has introduced more than 95 mobile gaming apps for Apple and Android products over the years, is front and centre in an industry sector that Statista.com – an online statistics portal headquartered in Hamburg, Germany – predicts will rake in $44.2-billion (U.S.) globally in 2018. With 16 employees, Noodlecake is just one of many small businesses – those whose payrolls number between 1 and 99 employees – significantly contributing to Saskatchewan's economy. According to December 2015 figures compiled by the Business Register at Statistics Canada, the number of small businesses in Saskatchewan – 40,453 – account for over 98 per cent of all of the 41,185 incorporated ventures in the province. “Small businesses have always formed the backbone of the Saskatchewan economy,” notes Alex Fallon, president and CEO of Saskatoon Regional Economic Development Authority (SREDA). Funded by the City of Saskatoon, Regional members and industry, one of the roles of the organization is to entice business to the Saskatoon Region. The increase in small business traffic has been steady, with 2,189 new ventures establishing themselves in Saskatchewan since 2012. “With entrepreneurship on the rise and a new generation of Saskatchewan entrepreneurs launching new companies, there is no doubt small businesses will continue to have a significant impact on the local economy,” says Mr. Fallon. SREDA has played an integral role in attracting business to the Saskatoon Region, helping local entrepreneurs and attracting $12-million in investments in 2015 alone. “Our role is to help grow the local economy by providing programs and services in the areas of business attraction, retention and expansion; entrepreneurship support; regional planning; economic forecasting and analysis; and marketing the Saskatoon Region,” explains Mr. Fallon. Citing Saskatchewan’s key sectors – energy resources, mining, agriculture, manufacturing, biotech and sciences – Mr. Fallon acknowledges that these areas are carrots dangled in conversations with prospective suitors. “One of the key advantages for businesses in Saskatchewan is the potential for long-term growth,” he says. Mr. Fallon sees “a real growth potential” in the Saskatoon Region, given its proximity to a wealth of natural resources and the “very competitive cost” of doing business in the region, alongside the advantages of local infrastructure, transportation facilities and a skilled workforce. It also is home to one of the world’s top agricultural biotechnology research clusters. SREDA attracts small businesses by supporting their analysis of the local market and connecting them to local partners and experts. Locally, he adds, they manage the City of Saskatoon’s Business Development Incentives Policy and actively seek out businesses that can benefit from the tax abatement incentives under this policy. While SREDA works on attracting businesses to the Saskatoon Region, some have established themselves without any convincing. For example, Noodlecake's Jordan Schidlowsky says he and Ty Haugen base their studio in Saskatoon for a very simple reason: it’s home. A University of Saskatchewan computer science grad, Mr. Schidlowsky says Skype meetings remedy the need to travel. Noodlecake's unusual location also appeals to small teams of developers and game studios around the world.